All right so I found that the fuses that were tied to the back half of the fuse block were 12V and the others that did not have voltage, were tied to the front half. So I jumpered to the positive post on the battery and viola. So I need to track down the lead and find where its fused and or open. Thanks I will be in touch. I found it. It is the 120 A main fuse, facing the engine compartment underneath the main terminals feeding the fuse box. Now to find the replacement, without getting raped. This is the best forum going. You guys rock. It's the moral support and the light hearted positive attitudes. Thanks everyone for chiming in. you are one lucky man... could have easily blown every fuse in the car along with the starter and computer..
there is a main fuse in the fusebox. 100A maybe? 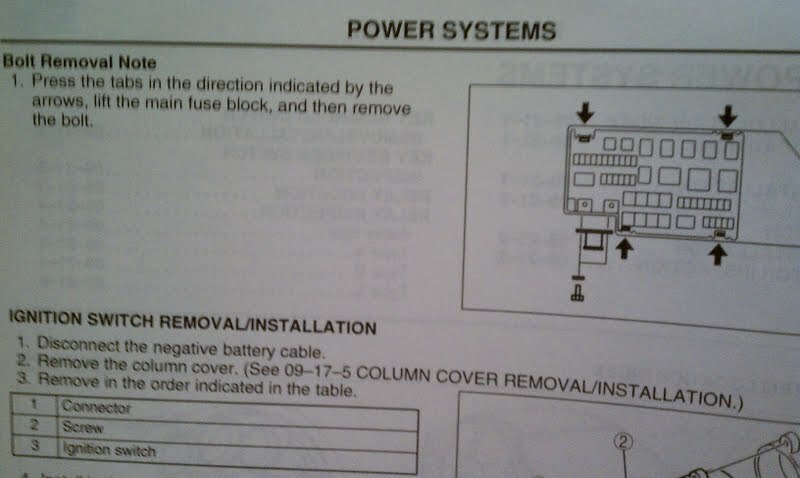 It will blow and save the rest of the fuses, computer, Armageddon, etc. Last edited by mac11; 02-15-2009 at 08:17 PM. I removed the plastic cover on the fuse and soldered the link back. My local parts store did not have this fuse. I will go to the pick a part later when I have time. Soldering the fuse back together is a VERY bad idea, if your car surges again it could be up in flames or everything might just go black again. Fuses have a certain voltage going to them for a reason.. how much the fuse can handle is determined by the size of the piece of metal in it. And if you added more you might have a problem on your hands after a little while with that..
Yep, you're right. I just had to use two pieces of stranded 16awg on someone's car today. BUT we ordered that 120A fuse and will be in on Thursday. I just explained to her that she needs to keep everyone away from the engine bay until it comes in and I go put it in. To the OP....................go order one........it's $8.00 and don't wait too long to put it in. 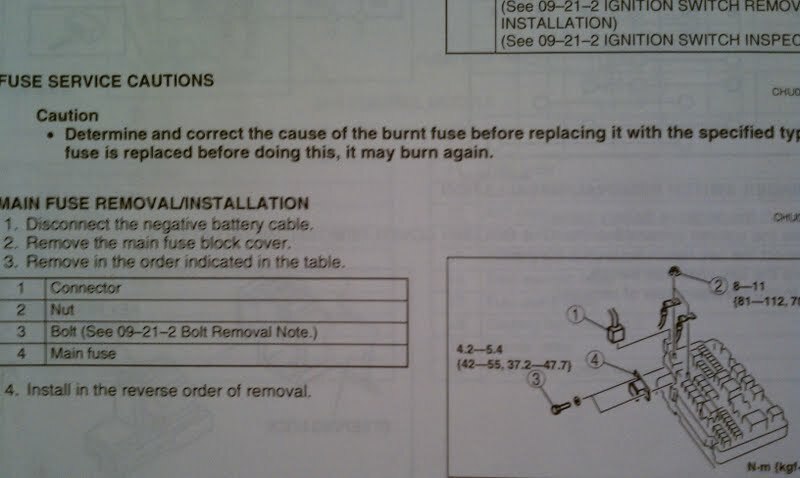 Soldering up that same fuse?......PRICELESS! Daamnnn only $8! The main fuse for my old honda accord was $120!!! Some parts for this car are stupid expensive and some are cheap as hell, lol. Well............that's what the said to her. I can only assume that they ordered the right one. but need help pulling it out.....? ANY ONE HAVE ANY IDEA HOW TO REMOVE MAIN FUSE ????? Yes, I have done it for someone that blew their 120A. However I don't exactly recall, but it wasn't rocket science. I think there where two screws or bolts that held it in. Wasn't any real big deal. As a matter of fact, and I shouldn't tell you this. While we waited for the fuse to come in at the dealer, I used a decent piece of wire(~12awg) to make her a temporary fuse(so to speak). You will have to carefully bend the tabs out to 90 degrees. I happen to have the full shop manuals, in case you need help with the detailed R&R instructions. It's < $5, so don't let a shop bill you $100 for this simple fix. Last edited by MPG > HP; 01-28-2011 at 10:16 PM. ^.....thanks...........saved those pics for future reference when someone needs them. Did it hurt the yellow top? I don't imagine it was on there very long before it blew the fuse. Most likely as he made contact with the 2nd post right? Did you have a discussion with him about what "+" and "-" means? (lol). (@ Buttonwillow, so switched to m. acct.) Np. The link blows b4 any critical circuits, so batt wld b last part at risk. Btw, foggy here, so slippery track. Lots of newbie spins. Hope to stay on track until sun comes out. This thread saved me a lot of headache. New Battery, still won't start, not even attempting to turn over. Checked fuses, and Engine 15A was the only blown fuse. Replaced this fuse and the car began to turn over before a loud pop. Now all of my interior fixtures no longer have power and the car still won't start. Checked the fuses again, Engine 15A was good, but Main 120A was blown. Replaced Main 120A and life has returned to normal. It seems when I originally crossed the cables I did two things, 1 - blow Engine 15A fuse and 2 - Severely damage Main 120A fuse. BTW, O'Reilly's stocks the 120A Main fuse. $4. Main 120 Fuse sits at a 90 Degree angle on the side of the box. Once you lift it up a bit you'll see there are two bolts (8mm) holding it in. Take off those bolts and pull the fuse out. i just connected my car to the battery wrong and everything turned on and i left it connected for a while like that, trying to turn it on... No fuse was burned and the battery is fine but now the car doesn't want to start however...this car has never ran since i got it with no engine and we are on our 2nd engine swap hoping that this one will work. Trying to test it but it wont start or try to start at all and the radio is blank dead. The first engine we mounted tried to start but due to low compression we got another so the car was fine before I connected the battery wrong and now it isn't what do I do the computer doesn't look fried so can it be the starter as well???? Complete radio and display power loss. HELPPPPPPPPPPP!!!! !